In 2006, the Stanford football team won just one game. After finishing dead last in the Pac-10, it was time for a change. Head coach Walt Harris was fired after his second season, and was replaced with the head coach from the University of San Diego: Jim Harbaugh. In his four seasons with the Cardinal, Harbaugh turned a one-win team into a one-loss team, as his final season with Stanford saw the team go 12-1 and beat Virginia Tech in the 2011 Orange Bowl. However, after his Stanford successes, it was time for Harbaugh to move to the professional ranks. Just a few days after that Orange Bowl victory, Harbaugh became the head coach of the San Francisco 49ers, a team that had gone 6-10 in the year prior to his arrival. Harbaugh led another miraculous turnaround, as the 49ers went 13-3 in the 2011 season, and made it all the way to the NFC Championship Game. That was enough for Harbaugh to win the Coach of the Year Award, but he certainly has not stopped there. During the offseason, the 49ers acquired three Stanford alumni who were coached by Harbaugh during their time in college: offensive lineman Jonathan Martin and linebackers Shayne Skov and Chase Thomas. 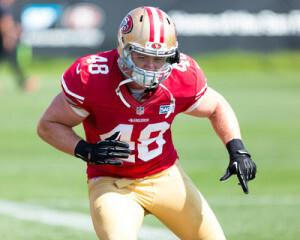 Martin’s first season with the 49ers will be his third in the NFL. He spent two seasons in Miami before the Dolphins traded him to San Francisco in the midst of accusations that he was bullied by fellow offensive lineman Richie Incognito. Despite his struggles with the Dolphins, Martin does seem comfortable on the 49ers’ roster. During training camp, he has been lining up at right tackle, although Harbaugh may try to play the former Cardinal at guard once tackle Anthony Davis returns to full health. However, Harbaugh said that he does not know when that switch might occur. Martin has gotten a share of first-team reps at right tackle, and has shown some potential as a quality run blocker. He has served as a lead blocker on some plays, opening up holes for the 49ers’ running backs, such as Frank Gore. There have been instances when he has been consumed by the pass rush, forcing the 49ers’ quarterbacks to scramble, but he is matching up against one of the toughest front sevens in the NFL, so the struggle to adapt is understandable. Martin has definitely shown signs of improvement, even though he has been facing such a tough defense in training camp. Two players hoping to make the cut on that defense are Skov and Thomas. Both players came in with an outside chance of making the final roster, but Harbaugh has applauded both of them for quality performances during training camp. The two have done a lot together throughout training camp. They often line up beside one another when the team runs plays, and they often hang out together during team drills. Thomas is a year older than Skov, but the former spent last season bouncing from New Orleans to Oakland to Atlanta to Green Bay on those teams’ practice squads. However, he should be expected to last a bit longer on the 49ers, given his familiarity with the coaching staff. 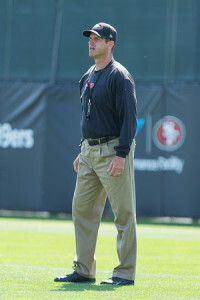 Current 49ers defensive coordinator Vic Fangio held the same position at Stanford during the 2010 season, and moved with Harbaugh to San Francisco for the 2011 season. The 49ers had a surprisingly notorious defense in that 2011 season, leading the league with 35 turnovers. 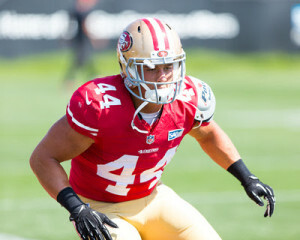 Fangio has so far done a great job in developing the 49ers’ defensive players, so Skov and Thomas have a bit of a head start, as they have worked with him before. However, there is one major drawback in ending up in San Francisco: The 49ers have arguably the best linebackers in the NFL. It will be hard for both of these Stanford alumni to find a place on a roster chock-full of stars, such as Patrick Willis, Navarro Bowman and Ahmad Brooks, who all made the Pro Bowl last season. However, Thomas thinks that there are advantages to playing on a team with such excellent players. Skov feels similarly about his chances of making it onto the final roster, and also feels that even though he has worked with this coaching staff before, he is not entitled to anything with regards to his spot on the team. Both Skov and Thomas have caught Harbaugh’s eye, but this certainly does not mean that either of them is assured a spot in the final roster. However, despite this uncertainty, Skov is trying his best to enjoy training camp as he is finally living the dream. Contact Nathan Desai at thegreatnate97 ‘at’ gmail.com.